Graphic editor without installation. Extract and run PhotoshopCS5Portable. 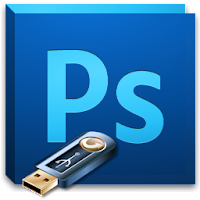 To change language, edit PhotoshopCS5Portable.ini with Language="one of the name of subfolders in App\PhotoshopCS5\Locales". klo bisa... serrver nya server local aza sob..
2012 ok sob,sory ya....tank atas pendapatnya..
@warnatulisan=>ok sob sama2 senang bisa bantu sobat..